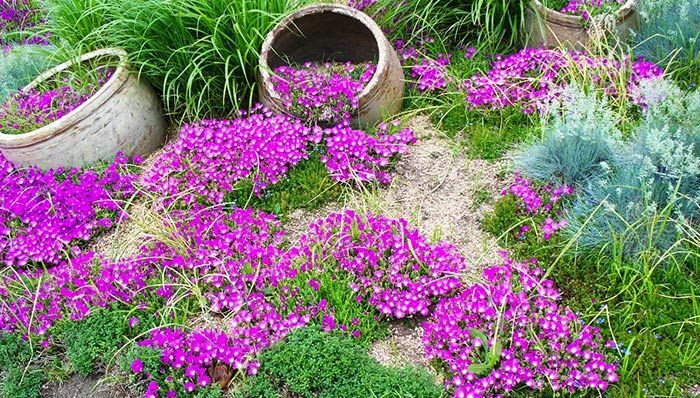 Ground Covers For Sale - Buy Ground Cover Vines Online. VINES SHIPS YEAR ROUND TO EVERYONE IN ALL STATES. ALL VINES ARE MATURE & BLOOMING AGE. A term used to describe plants that grow through stems that extend outward, sometimes climbing along surfaces like trees and homes. While their stems are also known as vines, common usage has left the term almost always referring to grapevines. "Climber" is commonly used for any plant with wall-scaling vines. Vines are known for the ability to climb various vertical surfaces, including poles, strings, lattices, and walls. Vines typically produce a woody stem as they mature, giving them strength to climb higher and spread wider. Their branches of leaves and flowers give extra coverage as they spread farther on surfaces. Bishop's Weed: Bishops weed, also known as snow on the mountain is a super hardy variegated ground cover. Its delicate bright green foliage with a white trim makes it a unique feature in a garden. They are high spreaders and cover unsightly areas in landscaping or where you can not keep mowed and maintained well. They hide ground debris and weeds. Home gardeners who like small foliage that is well-behaved should consider English ivy. This vine is perfect for hanging baskets, containers or as a ground cover. English ivy is also a good choice for climbing on trellis, porches and other structures. Garden Phlox: Garden phlox is a beautiful lavender ground cover that turns a pinkish color in low alkalinity soils in late summer. It's versatile and makes a carpet-like appearance full of delicate blooms covering the entire plant. Perfect for planting on hills or near rocks to gently climb and bloom all summer long. When preparing your vines to climb fences or a trellis, interweave the new shoots through the openings as they grow. If you are training vines to twine around masonry or trees, you can attach a wire to the structure at the base for the vine to climb. Taking just a little time to train your vines will bring big rewards. Your fence or other arrangements will have good coverage as these plants grow upwards. Decorating with vines is a wonderful thing and will bring character and also a gorgeous look to a lawn and can also be used inside of a home. If the lighting and natural light is great in a room such as a sunroom on a home, a vine will be gorgeous to grow and train to become all throughout the room. It will need some timbers or sticks to expand on but will be gorgeous as it grows and will also add a spectacular color of green to a room. Vines are also great to grow outdoors and are often used to cover sides of old buildings and can also be trained to grow on fences. Vines will also look amazing as they are trained to grow on a trellis at the entrance way of an extended or short walkway and will also look great when added to a deck or patio. There is a wide variety of vines available, and some will also produce gorgeous flowers that can be enjoyed. The Wisteria vine is a gorgeous one when it is in bloom, and it will supply beautiful lavender flowers that will also attract butterflies and also hummingbirds to a location. During the summer, when the vines are in bloom they will look great and will also add lots of colors. Trumpet vines will offer smaller flowers that will look like tiny trumpets. This vine will work great on a trellis and will look fantastic when added to a garden or natural area. Vines are very easy to grow and can be trained very easily by just tying the vine to a fence or trellis with some soft material so that the vine is not damaged. Once the vine grows, it will add a lovely look and will also supply a very natural look like it has been growing there all along. There are also some vines that will have a beautiful shade of green such as the English Ivy. The leaves on this vine will look fantastic, and this vine will grow to cover a section of fence or the side of an old building.